1968 was an historic year in modern American firearms development, with the founding of Dan Wesson Arms. 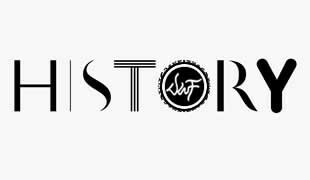 This fledgling firearms manufacturer was a collaboration of Daniel B. Wesson, the great-grandson of D.B. Wesson, co-founder of Smith and Wesson, and Karl Lewis, formerly of Browning and Colt firearms. The founders of Dan Wesson Arms were committed to the development and production of a modern revolver, modular in design with interchangeable barrels, grips, and sights. The Dan Wesson revolver design is extremely strong and durable, and noted for consistent pinpoint accuracy. The history of Dan Wesson Firearms reflects the epitome of American entrepreneurship, manufacturing, and firearms development. Although Dan Wesson Arms is known for revolvers (and later 1911 semi-auto pistols) the first firearms to bear the Dan Wesson name were a series of shotguns and air rifles imported by Dan Wesson in 1969, manufactured by firearms giant Brno Works of Czechoslovakia. The first Dan Wesson revolver premiered in 1969 at the NSGA show in Houston. The first production revolvers shipped in August 1970, and were known as the Model (or W) 11 (fixed sight) and Model/W 12 (adjustable sight), retailing for $110. The Model 11/12 series featured an external barrel nut, “porkchop” style shrouds, and large, crudely manufactured sights, but included the revolutionary interchangeable barrel/shroud design. Production quickly moved to the Dan Wesson owned facility in a converted schoolhouse in Monson, MA. 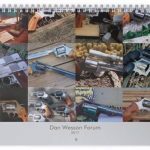 Dan Wesson Firearms capitalized on the unique interchangeable barrel design by offering Pistol Packs, packaged in a fitted case with a variety of barrel/shrouds and grips. In September 1971 the recessed barrel nut debuted with the 14/15 Series. While the most visible difference was the lack of external barrel nut, the 14/15 began several years of continuous refinement, reflecting many running design and production changes. Models 14-1/15-1 incorporated new sights, extractor rod, cylinder latch, and numerous production refinements. The -1 series was essentially a “research and development” phase of the classic -2 series of Dan Wesson revolvers. The most noticeable change in the 14-2/15-2 series of revolvers, introduced in early 1975, was the elimination of the footed “porkchop” shroud. The straight shroud allowed much simpler production, from cold drawn bar stock, of barrel/shroud lengths up to 15”, in a variety of styles (V, H, VH, etc.). Other changes included a transition of some internal parts originally manufactured from sintered (molded, powdered steel) metal to cold drawn steel, allowing for a more durable and “fittable” action. 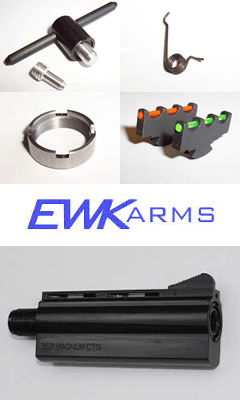 Many components (trigger, hammer, hand, etc) were redesigned to be more durable and functional. Marketing of Dan Wesson revolvers of this era focused heavily on the Pistol Packs, which included embroidered patches and belt buckles. With minimal changes, the -2 series continued in production for 30 years, through several company ownership and management changes. 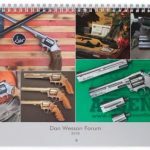 In November 1978 Dan Wesson Arms in particular and the firearms industry in general were dealt a blow with the death of Dan Wesson. Production of Dan Wesson revolvers continued, and in late 1980 the Large Frame revolvers were introduced, initially in .44 Magnum. 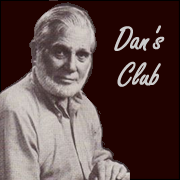 The Large Frame Dan Wesson helped popularize the revolutionary SuperMag cartridges developed by Elgin Gates, and established an era of long range revolver shooting. Dan Wesson revolvers soon defined and dominated metallic silhouette shooting, and were produced in a wide range of cartridges. 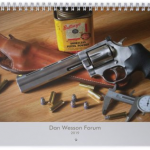 The 1980’s were turbulent times for Dan Wesson Arms, with significant financial and management re-organizations. In August 1982, the Stainless Steel Model 715 was introduced in .357 Magnum, a development that reportedly would have been opposed by Dan Wesson. Stainless models quickly proliferated, from .22 Long Rifle through the Large Frame/SuperMag models. In 1983 Dan Wesson Arms re-organized as Wesson Firearms, under the continuing management of Seth and Carol Wesson. In 1992 manufacturing and management operations relocated to Palmer, MA. Although the great era of innovation was over, production of classic Dan Wesson revolvers continued. In 1992, fixed barrel revolvers were introduced to compete with Smith & Wesson and Ruger in an increasingly price conscious marketplace. 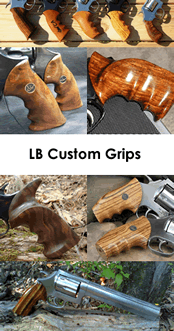 The company continued to struggle financially, and quality is reputed to have suffered through the entire era after Dan Wesson’s death, a perception that is largely unfounded. In 1996, the Wesson Firearms brand was purchased by Bob Serva, who renamed the company Dan Wesson Firearms and relocated to Norwich, NY. The factory was retooled with modern CNC machining equipment, and in December 1997 the first of the “new” Dan Wesson revolvers shipped from the NYI/Dan Wesson factory. In 1999, the Dan Wesson Pointman (Government) 1911 Semi-Automatic Pistol in .45 ACP was introduced, followed closely by the Guardian (Commander) 1911. The Dan Wesson 1911’s were originally produced in Stainless Steel, and were assembled from frames and slides produced in the Norwich facility, fitted with top quality components from a variety of premiere quality 1911 manufacturers. Dan Wesson 1911’s have developed a reputation as excellently manufactured production pistols, and are prized in the 1911 community for factory fit and finish. In early 2005, CZ-USA purchased the rights and manufacturing facilities of Dan Wesson Firearms. Revolver manufacture was continued for several years, with a focus on large caliber revolvers, notably the Alaskan Guide Series. Revolvers are no longer manufactured by CZ-USA, however excellent factory support for parts and service continues, as does an active catalogue of 1911 models of very high production quality. 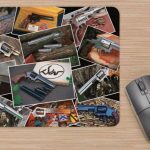 Next What Makes Dan Wesson Revolvers Unique?